GENERAL CROOK WITH ONE OF HIS APACHE SCOUTS ALCHESAY – AN UNPUBLISHED CABINET CARD IMAGE – PHOTOGRAPHER ANDREW MILLER, GLOBE ARIZONA – VERY RARE IMAGE: In excellent condition, this is a heretofore unpublished image of General George Crook with one of his Apache scouts – believed to be his favorite, Alchesay, a White Mountain Apache. General Crook, one of the most well known military commanders on the post-Civil War frontier, spent a considerable amount of his career in the Arizona Territory – so much so that the Apaches became sufficiently familiar with him to name him “Nantan Lupan”, Gray Wolf. In 1871 President Ulysses S. Grant appointed Crook to command the Arizona Territory, directing him to bring an end to the conflict between the Apaches and the white settlers. It was during this first assignment in Arizona that Crook established his well known relationship with, and dependence on, Apache scouts, employing large numbers to successfully track and negotiate with the hostile elements of the tribe. By the fall of 1872 Crook had conducted successful campaigns which brought the Tonto Apache onto a reservation and he negotiated a treaty with Cochise which would last until the leader’s death two years later. In contrast his disciplined and unwavering commitment to bringing peace to the territory and controlling the violence between the whites and Apaches, Crook remained a very active and vocal advocate for the Apaches, as well as all the tribes in Arizona. He promised, and delivered, many improvements to the reservations, and opposed such measures as sending the Indian children to schools in the east. 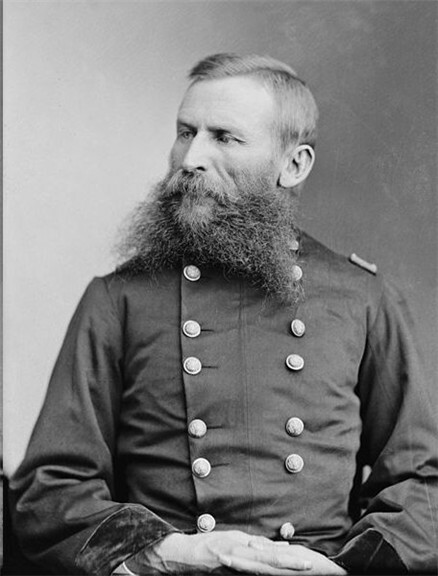 Crook, promoted to Brigadier General and transferred to the Department of the Platte, held the northern command through the height of the Plains Wars, to include the summer campaigns of 1876 which included the Battle of the Little Big Horn. In 1882, Crook was ordered back to command the Department of Arizona due to the Apache break out from their reservations, resuming their raids against the settlers. Over the next four years Crook again employed his Apache Scouts in repeated efforts to bring the Chiricahua Apache leader Geronimo and his followers to bay. Any resemblance of peace in the territory was fleeting at best, as Geronimo would surrender for a time until the next provocation caused him to flee into the mountains or across the border into Mexico. The failure to bring this ongoing problem to a permanent end resulted in Crook being replaced by his long-time rival General Nelson Miles in 1886. Miles effectively resolved the issue by forcing Geronimo’s surrender and then shipping him and his followers to Florida, permanently removing them from their home land. In a final twist of ignominy, Miles not only included the hostile Apache in this exile, but also many of the Apache Scouts who had served the army – and both Crook and Miles - so faithfully, and were arguably the very reason for Miles’ eventual success. Crook was furious over the treatment of the scouts, and reportedly never forgave Miles or the U.S. Government for this act of betrayal. Crook returned as the Commander of the Department of the Platte from 1886 to 1888, and he was serving as the Commander of the Division of the Missouri when in 1890 he died suddenly of a heart attack in Chicago. General Crook and his wife are buried at Arlington National Cemetery. The Apache in this image is believed to be Sergeant William Alchesay [aka Alchisay], one of the most prominent scouts who served the U.S. Army throughout the Apache Wars, and who had a close relationship with Crook – some say the General’s favorite. Born between Globe and Show Low, Arizona in 1853, he enlisted in 1872 at Camp Verde, Arizona, and became a Sergeant in A Company, Indian Scouts, commanded by Lieutenant Charles B. Gatewood, 6th US Cavalry. Sergeant Alchesay was one of the Apache Scouts who guided Crook’s columns during the Tonto Basin campaign of 1872-74, and was awarded the Congressional Medal of Honor for his gallantry. Discharged at the end of the campaign in 1874, Alchesay returned home. 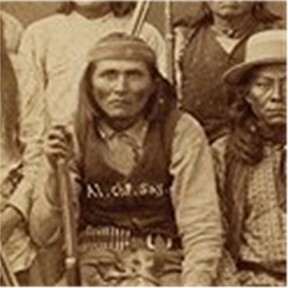 He was one of the Apaches arrested in the wake of the Cibecue Mutiny in 1881, but was soon released after it was determined he had no meaningful role in the events leading up to the incident. Upon Crook’s return to Arizona in 1882, he renewed his contact with Alchesay who briefed the general, providing insight into the situation with the Apaches and the developments which had occurred during Crook’s absence. 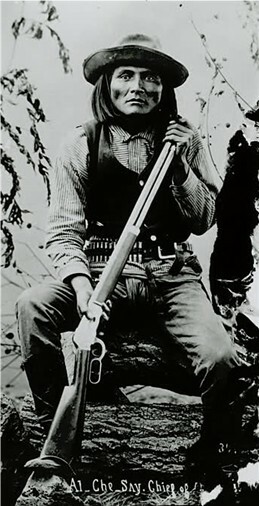 Although Alchesay’s name does not appear on the known roles, it is believe by some that he accompanied Crook into Mexico and was present during the fights in the Sierra Madre Mountains. By the time he was discharged at the end of the Geronimo Campaign, Alchesay had served more than fourteen years in the Army, and after his return home, he eventually became a chief of the White Mountain Apache Tribe. He made several trips to Washington D.C., meeting with officials from the Office of Indian Affairs, and Presidents Cleveland, Roosevelt and Harding. Alchesay retired from his leadership role in the tribe in 1925, and in that same year he applied for his pension benefits from the army under the name William Alchesay. Alchesay died at his home in Forestdale, Arizona in 1928, and was buried near Little Round Top Peak. 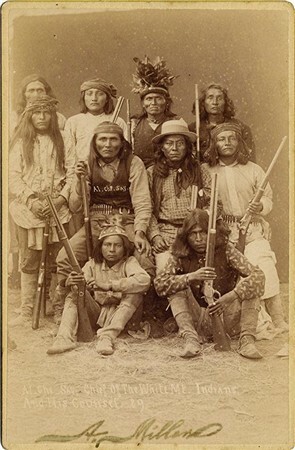 The Apache in this image bears a strong resemblance to other known, identified images of Alchesay (two of these identified images are included below), so close that I feel certain the Apache standing next to Crook is indeed, Alchesay. This bottom of the image is heavily embossed with the photographer’s name, “A. Miller” for Andrew Miller, and the photographer’s studio location of Globe, Arizona. I was unable to find much detailed information about Andrew Miller except that he was a contemporary of C.S. Fly of Tombstone, moved to Globe from Silver City, New Mexico, and was active in Globe ca. 1886, the same year Crook and Alchesay were affecting the surrender of Geronimo. As Crook left Arizona in 1886, this image must have been taken before his departure. Further, Forestdale – Alchesay’s home - is northeast of Globe, in the same east-central part of Arizona, and both are well within the area dominated by Ft. Apache during the Apache Wars. This coincidence of timing and local placed Miller in the same vicinity and moving within the same population as General Crook and Alchesay. That Miller would arrange to capture the image of Crook and his stalwart scout, Alchesay was a good business decision as this image would have had significant value for the retail sales of his images. Images by Miller are apparently relatively scarce compared to other more prolific photographers of the same period. This particular image is believed to be quite rare and as far as I have been able to determine, it has not been published. The length of Miller’s stay in Globe is unknown, but his death at the hands of Yaqui Indians in Sonora, Mexico was recorded in 1899. This cabinet card, measuring 6 ½” by 4 ¼”, is in excellent condition with no damage or fading to the image and the card is full form with no damage to the edges.